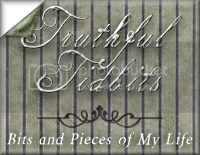 Truthful Tidbits - Bits and Pieces of My Life: How God Gave Me the Title For My Blog! My kids had been telling me that I needed to write down all of my childhood memories so that the grand kids could have them and know what my life was like back then. They said that I should write a book full of my stories. Well, I do love to write, and I do have a lot of stories...so one day while I was in the shower I was thinking about it, and wondering if I could really write enough to fill a book...and thinking if I did...what would the title be? Then all of a sudden it came to me that I would call it "Truthful Tidbits". I imagined a cover for the book with an ocean view and some palm trees and a bunch of pineapples sitting around with some of them sliced open, and a pretty bowl full of pineapple "tidbits" on the table with other delicious looking foods. I thought of those "Front Porch Tales" books and I thought my book could be like one of those with various stories from my childhood when I was growing up. And just everyday stories from adulthood too, that might encourage someone. My mind was racing with excitement. Well I finished my shower and proceeded to tell my husband about my idea...and guess what? He didn't really like my title very much. So I kind of put it on a back burner. Before too long my oldest daughter Lisa, told me that I needed to start blogging as an outlet for my writings. At that time she wasn't blogging yet, but she did enjoy reading several blogs. So, I started entertaining that idea. Then my middle daughter Lynnette, and her daughter Abigail, persuaded me to start a blog, and they even set it all up for me. Lynnette liked my title and said for a sub title I should add...Bits and pieces of my Life. Truthful Tidbits...Bits and Pieces of My Life. I really feel like it was all meant to be. And I enjoy blogging so much. I have been doing it for over a year now and I simply... LOVE IT! I don't know if the book will ever become a reality, but blogging is an avenue to save my writings for my kids and grand kids. Along the way Abigail started a monthly poetry post and I joined in. That's when I discovered that I love to write poems too. It has become a favorite past-time for me. I wake up in the mornings early with poems in my head. So, I get up and get on the computer and write down what I am thinking. Some people don't get into poetry, but I do...it is a good way for me to write down what I am feeling in my heart. On this year long journey I have met so many nice people and I have added so many of you to my prayer list. I especially love to pray for my "Blog Babies" as I call them. There are so many with health issues, and I feel they need our prayers. I have kind of adopted a couple of special young mothers as my daughters, as my heart is full of love for them. I have also met several nice ladies who know the joys of being a grandma and we have bonded too. Some of you are so funny and you give me my daily chuckles when I read your posts. Others of you more mature Christians have challenged me and blessed me with your writings. When I am sick and haven't posted for awhile several of you contact me to see if I am ok. And when we travel it is always fun to post about our trips and to share pictures from our travels and from our family gatherings. And because of your posts and pictures I feel like I am getting to know you all so much better. I wondered if anyone would become a follower of my blog and to my delight...they did! A BIG THANK YOU to all of you who do follow me and take the time to read my stories and my poems. I am very fond of you all. Another joy is to visit your blogs and to read what you are posting and to leave comments to encourage you. I feel like it is a ministry that God gave me. Yes...all of this has been a great blessing to my life in the last year and I thank God for leading me to blog land! It is a place where I can share...Truthful Tidbits...and Bits and Pieces of My Life. Praying for you also! I'm home today with 2 sick children, Samuel and Caleb. I'm glad we've "met". You and I are very similiar. I started blogging to have a place to put all my memories and thoughts. Maybe someday I'll compile them. They may not get published, but at least they can be printed for my grandchildren. I love poetry, too! It's so much fun to arrange words, to make music with them! I came up with the title of my blog because that is one of the songs my Mom used to sing to me and I wanted to somehow use it for my business name, but it was just too long, so when I was thinking of a blog name, I thought it was perfect! Hope you get to feeling better, Momma Linda! It is amazing how many friends you can meet out there in blogging land. Glad our paths have crossed also! It was interesting to learn how your blog and its title came to be. You are encouraging to us all and I think your stories are ones that everyone, and not just your grandchildren, will love. I enjoy visiting with you through our blogs. I'm glad you started a blog and I'm so glad I met you. I just love to read your posts and so filled with God and love. Linda, thanks for sharing how it all started for you - such a neat story. I think your title is perfect and wouldn't it be fun to make this into a book someday? I am SO thankful for you - your words are always an encouragement. Thanks for building up this young mom and teaching me the way I should go! I wish, i wish i could get my uncles & aunt to do the blog thing. They send out these emails of their remembrances of childhood, but they are so easily lost & difficult to follow after a number of different comments. I started a blog for them, but no one uses it. My eldest uncle is getting up there (76?) & i'm afraid these stories will all soon be lost. What a wonderful thing you are doing for your daughters, grandchildren, & the rest of us! Oh Linda, how blessed your children and grandchildren are to have you. I love your stories and encouragements. Thank you for writing them down for others to benefit and learn from. You put this so well... the blog world allows us to create bonds and connect with souls whose lives would never have touched otherwise. I think the most wondrous gift from being in this sphere are the prayers it generates...some are asked for...others sent because we, you, all of us, sense the need. What a lovely gift. I wish you had your email set up on here so I could email you back. Your comment on my blog was so encouraging thank you!! Part of the reason I am moving to New York is because my best guy friend and I were talking about all my problems finding a job with a tight schedule (since my kids are in school and after school programs have NOT worked in the past - both kids started failing classes when enrolled in after school). He told me about 4 months back that it was time someone stepped up to the plate and took care of my kids and I and gave us the financial freedom and security we so desperately need. He's also teaching me how to do html and learn CSS and a few other things computer wise so that I can work from home if I desire. Well to make a long story short he and I have been best friends for almost 2 years now, I've been in love with him for 18 months of that time. Shortly before Christmas he confessed that he loved me and my heart just sang. He then asked if I would be willing to move to New York so that he can be the one who takes care of my girls and I from this point on. He's paying for the move and everything. I know this is God's answer to my prayers because of so many reasons (of which I will be glad to email you but would rather not announce publicly). It's just tough in the mean time because it really would be nice to have a job and save up some money in the mean time!! I know that God's plan is best and I have to trust him but sometimes trusting in the unseen is just so hard. Thank you again for your kind words of encouragement and your prayers!! I've so enjoyed reading your poems and stories! And I want to thank you for being such a Godly example of a wife and a mother for all of us younger ones!! I am sorry you've been ill. I so hope you're all better. Here are some pretty fragrant roses via internet/blogging that you can pretend are being delivered as I type. They are your favorite color and smell heavenly! God bless and get to feeling better soon. God Bless you richly today! Thanks for sharing this story with us! I love the title! You share so easily from your heart and that is truly a blessing! --- Now have a hankering for some pineapple, lol! Thank you for visiting my blog,and for all the kind comments you leave Josh. Isn't he wonderful???? I love your sweet daughter, too!